A group of South Shore lobstermen say they know what the answer is and they have banded together to try to do it, but they need help. Right whales gather at dusk in the Bay of Fundy in New Brunswick, Canada. BY THE TIME MIKE LANE shoves off the Cohasset docks, it’s past 8 a.m. — practically lunch time for a lobsterman. But it’s early spring, and the South Shore fisheries are mostly closed, so Lane is keeping a somewhat relaxed schedule. Lobsters tend to hole up for the season several miles farther offshore, and Lane would like to be there, fishing his 800 traps. That area also happens to be a feeding area for North Atlantic right whales — one of our planet’s most endangered species. And so, four years ago, the federal government closed these grounds for much of the winter and spring. That means all Lane can do right now is set a few traps in a small area just outside Cohasset Harbor. Lane knows he won’t catch much there. But he has two small kids and says he can’t afford not to go. He bundles up a couple of times a week and makes the trip, often returning with just a handful of lobsters. Knowlton nods. She knows exactly what Lane is talking about: the year’s first right whale death, a juvenile cow found floating on her side off the coast of Virginia, tangled in heavy fishing gear. 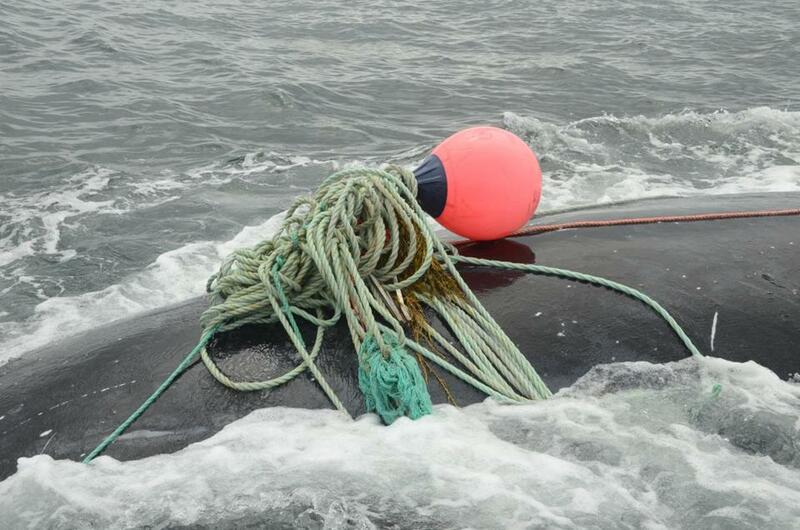 The whale, identified as Right Whale #3893, had ropes wound so tightly around one of her flippers it had exposed bone. The lines had also sliced across the top of her head, leaving a series of deep gashes. Right whales have big mouths, with tongues the size of Volkswagen Beetles. In her mouth was so much rope she could no longer eat. The lobsterman and scientist spend most of our half-hour ride out to the traps discussing #3893. Did she die of starvation or sepsis blood poisoning — caused by the massive infection in her flipper? Either way, they agree, her death was gruesome and slow. Could the thick line wrapped around the young whale have been from crab pots off Georges Bank? Maybe offshore trawlers? It didn’t really matter. Biologists set an annual extinction risk number for endangered species to show how many animals can die from unnatural causes without further threatening the species. For North Atlantic right whales, that number is less than one. New England Aquarium researchers observe North Atlantic right whales in the Bay of Fundy. FULLY GROWN RIGHT WHALES can exceed 50 feet in length and weigh around 70 tons, making them one of the largest animals to occupy the planet. The North Atlantic right whale is one of three types of right whales, along with the North Pacific and Southern right whales. All are baleen whales, possessing a mouth full of comb-like plates, rather than teeth. The massive North Atlantic right whale’s plates have evolved to filter and collect prey less than a tenth of an inch long — tiny invertebrate crustaceans called copepods. A right whale needs between 400,000 and 4 million calories a day, as many as 2 billion copepods. This time of year, a right whale will feed around the clock, pausing every 20 minutes or so to breathe. For millennia, this was a highly successful evolutionary niche. There were about 10,000 North Atlantic right whales around the time of Columbus. But copepods tend to congregate in the same waters humans do — places such as Cape Cod Bay, Georges Bank, and the Gulf of Maine. 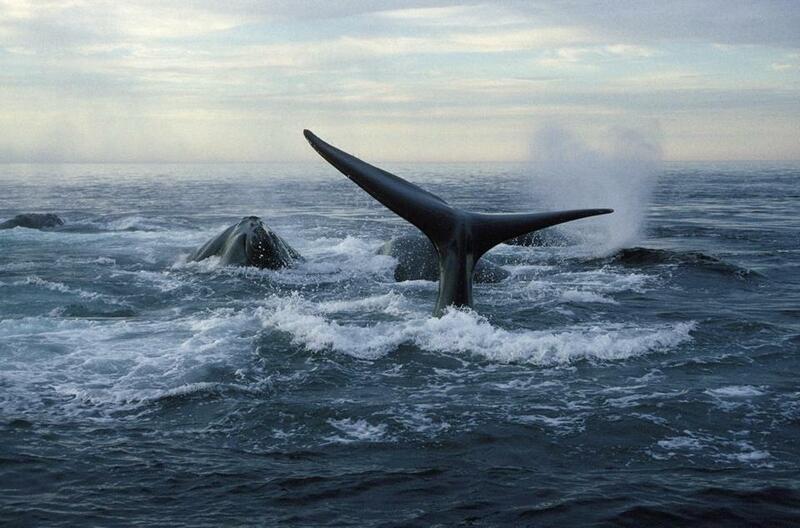 The right whale’s feeding practice — swimming slowly and often near the surface for hours — made them easy to kill. And so we did — in prodigious numbers. In 1935, the US adopted the Convention for the Regulation of Whaling, which severely limited the hunting of baleen whales worldwide. By then, as few as 100 North Atlantic right whales may have remained. A decade later, sightings dropped off entirely, leading many scientists to worry the species was extinct. But around the early 1960s, the species resurfaced. Conservation efforts began in earnest, including the 1972 Marine Mammal Protection Act and 1973 Endangered Species Act, which mandate the value and protection of depleted species and ban all activities that would harm, kill, or harass them. Implementation of these acts as they relate to North Atlantic right whales falls mostly to the National Oceanic and Atmospheric Administration’s National Marine Fisheries Service. In 1996, the NMFS formed the Atlantic Large Whale Take Reduction Team, bringing together fishermen, scientists, conservationists, and state and federal officals to make conservation decisions. 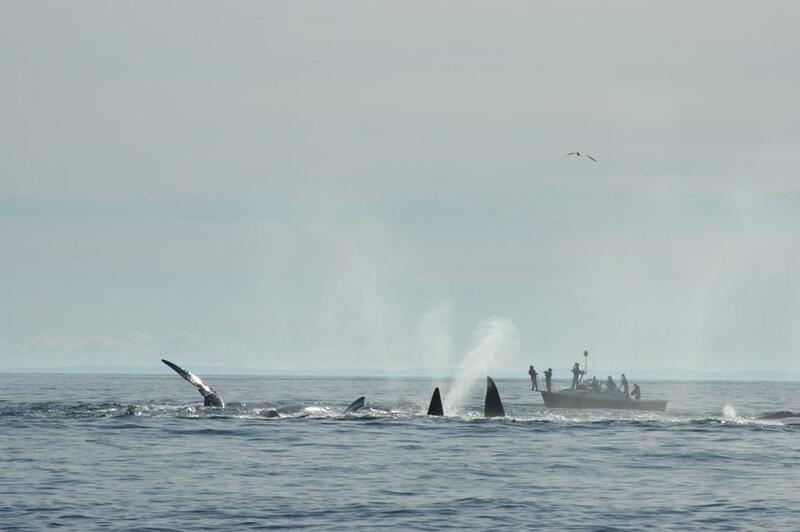 This group developed rules such as restricting vessels from coming within 500 yards of any known right whale, created an alert system notifying ship traffic about the location of whales, and put limits on fishing locations. It also established entanglement teams to help free whales that became snagged. In the years following implementation of the rules, population numbers for the North Atlantic right whale began to rebound. But since 2010, that trend has reversed. Over the past decade or so, we’ve lost about five whales annually, mostly to gear entanglements and, sometimes, ship strikes. Last year was a particularly devastating one for right whales, with at least 17 human-caused fatalities. That has led to an easy but nevertheless grim consensus in the scientific community: North Atlantic right whales aren’t just in trouble — they are in crisis. Scientists estimate there may be only 430 left. Should their mortality rates continue, they may well be functionally extinct by 2040. The life history of whale #3893 illustrates why. Thanks to the North Atlantic Right Whale Catalog, created by marine biologists in the early 1980s and now maintained by the New England Aquarium, biologists and fishermen alike can know as much about some of these whales — where they’ve been seen, what their kids are up to — as they do their former roommates and Facebook friends. They know, for instance, that #3893 was born in 2008, and was on the cusp of her child-bearing years at the time of her death. Her half brother died at just 1 year old and was found with three different sets of gear tangled around his flukes. Her father, a robust 37-year-old, was killed in the Gulf of Saint Lawrence in 2017 — the apparent victim of a ship strike. Whale #3893’s mother, also an entanglement survivor, may still be alive, but hasn’t been seen since 2016. Charles “Stormy” Mayo, director of right whale ecology at the Center for Coastal Studies in Provincetown, can recite a lot of this kind of family history by memory. Like Lane, Mayo is also the son of a Massachusetts fisherman. His father made a brief foray into whale hunting, but told his son he quit after harpooning a calf pilot whale and watching as its mother struggled to save her dying baby — an emotional and bloody scene that would forever haunt him. The younger Mayo didn’t set out to become an advocate for right whales, but since he’s a biologist who specializes in plankton, baleen whales became a focus of his research, too. He cofounded the Center for Coastal Studies in 1976. Since then, it’s grown into one of the country’s leading programs for marine mammal research. The center’s history with #3893 includes an encounter in April 2011, when she was spotted in Cape Cod Bay about 10 miles south of Provincetown. She was tangled in netting and several float lines, which streamed from her mouth and probably prevented her from eating. The center’s disentanglement team cut one line with a special blade attached to a long pole, but was unable to free her. The team returned to Provincetown fearful that #3893 would soon become another casualty. But the next day an aerial team again spied her; somehow, she had freed herself. Amy Knowlton, a senior scientist at the New England Aquarium, has been working with South Shore lobstermen on a breakable fishing line. THE SAME MONTH that #3893 was found dead, three national nonprofit conservation groups filed a complaint in federal court alleging that the Department of Commerce and the National Marine Fisheries Service had failed to properly manage the lobster industry, and that more protections for right whales are needed. Some marine mammal advocates would like to see fisheries closed for good in known whale habitats. 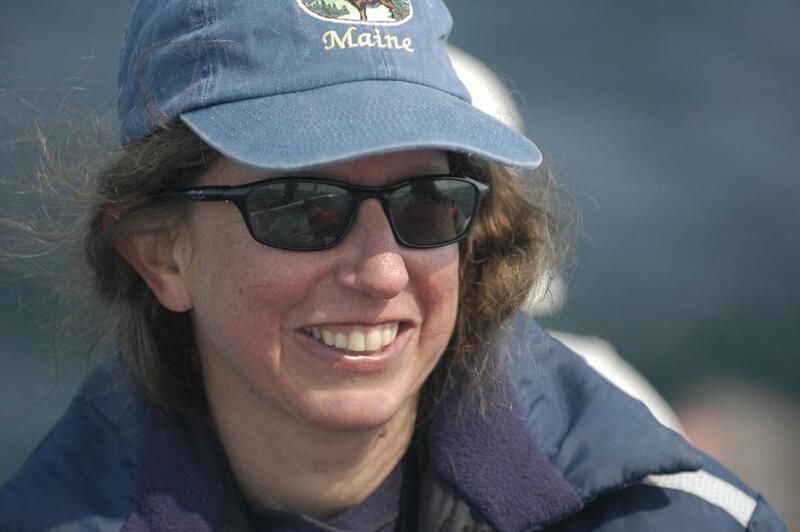 Amy Knowlton, the research scientist I met on Mike Lane’s lobster boat, has been studying the impact of fishing on the remaining whale population. She believes there’s a direct correlation between whale mortality and the ropes used in trap-based industries such as lobster and crab fishing. 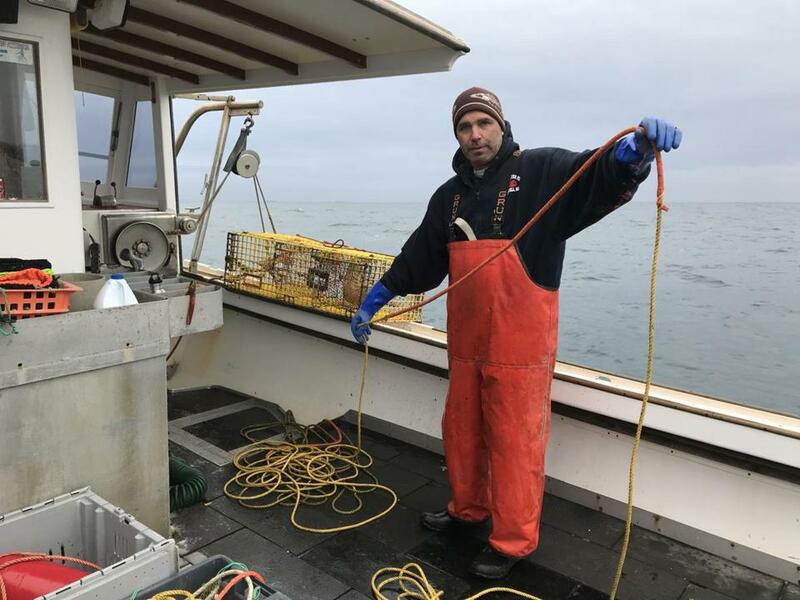 A fisherman in Cape Cod Bay will set as many as 10 or 15 traps on a single pair of buoys, connecting them to one another with ground lines and then to a buoy surface line. A single set of traps may contain hundreds of feet of rope — a dangerous obstacle for a massive animal swimming with its mouth agape. Fifty years ago, most of that line was made of natural fiber. Today, it’s made largely of polypropylene and is twice as strong. That means fewer traps are lost, but whales are less able to break free of entanglements. It also means that any line that wraps around a whale today will cause significantly greater injuries than rope made just a few decades ago. Once ensnared, a whale will twist and thrash in an attempt to shed the rope, often becoming further entangled. Then, in late fall of 2015, as another seasonal closure was about to begin, a small group of the lobstermen gathered in the garage of the association’s president, John Haviland. Some of the men were set to lose tens of thousands of dollars — a lot of money for families already living close to the bone. They started talking about the rise in entanglement deaths, the increase in rope strengths. If there was just a way they could fish with rope a whale could break. . . . Haviland started pulling out spools of different types of line. They cut it into long lengths, then tied one end to a tree and the other to their pickup trucks to see if they could break it. Eventually, they began focusing on a light braided rope used for gillnetting. If a tired old Ford could break it, maybe a whale could, too. Problem was, that line would also break under the weight of a dozen lobster traps. So the lobstermen experimented with cutting it into sleeves, then threading segments of their own line into each sleeve. It wasn’t perfect, but if a whale could break that sleeve, it’d be entangled in just 40 feet of line instead of 400. The lobstermen began calling rope manufacturers. Most said it just wasn’t cost effective to make the modified rope. So they contacted Knowlton, whose scholarly publications they had been following. She was intrigued by their project. Together, they found a little grant money to make a few prototypes. At night and on slow fishing days, the men would sit in their basements, slicing holes through the braided rope sleeves and slipping their line in inch by inch, hoping it would work. Eventually, Novabraid, a rope maker in Nova Scotia, agreed to make the sleeves. It’s far from a perfect fit, but it’s a start. Mike Lane shows off prototype breakable line developed largely by South Shore lobstermen. ON THE DAY I MOTORED OUT with Lane and Knowlton, we checked some of the traps that use this new rope system. Knowlton and I watched as Lane hooked a buoy and began winching the hundred feet of line that connected his 15 traps. The bright orange gillnetting sleeves were clearly visible and seemed to be holding up just fine. Last year, the South Shore Lobster Fishermen’s Association petitioned the NMFS take reduction team to have their fishing grounds returned to them. They noted that much of the waters where they fish haven’t had an entanglement. They demonstrated the breaking strength of their improvised line. But their exemption request was denied. Most of the members of the team who heard the appeal wouldn’t comment on the specific merits of the lobstermen’s case. But they did say they’re wary; they say it’s too soon to tell whether a whale could break free of the improvised line without injury. And the stakes are just too high if the whales can’t. In 2001, the effort to disentangle Churchill the right whale drew national attention. Despite multiple tries, like this one off Cape Cod near the end of the whale’s life, Churchill could not be freed. But Lane insists technology can help both species if we invest now. Lobstering is a $660 million industry. About a thousand fishermen are affected by the closure in Cape Cod Bay alone. They receive no government subsidies whenever the fisheries close. They can’t even collect unemployment. This season, Lane has been able to find work as a day laborer felling trees. Other lobstermen haven’t been so fortunate. And they all agree they don’t want a handout. Instead, they want to be on the water, setting and checking traps. They point out that they’ve already accommodated every mandate made by the take reduction team: they’ve changed their ground lines; their buoys have quick-release clasps; and they’ve spliced colored line into their ropes so that entanglements can be traced back to a single fishery. They’ve paid for a lot of it out of pocket. Lane estimates it would cost him about $30,000 to replace all of his lines with weaker ones, a small fortune for a South Shore lobsterman. The survival of a species shouldn’t come down to money, but it often does. For right whales, nobody knows what it might actually cost to save the species. In reality, the price is probably astronomical. Right whales aren’t just getting tangled in lobster lines and being struck by ships. Some scholars speculate that pollution and climate change are making copepods harder to find. The whale’s habitat has become so noisy that the range at which they can communicate with one another is less than 10 percent of what it was just a century ago. For a social species that relies on mating calls to reproduce, that’s a big problem. Not a single new calf has been observed this year. There should be a dozen. Is it even worth trying to preserve such a beleaguered species? Everyone I spoke to for this article said yes. They pointed out the intrinsic value of a giant mammal, and the real benefit to the planet that biodiversity affords. They argued that we put whales in this predicament and thus are morally obligated to save them. They returned to the Endangered Species Act, which compels us by law to do so. We’ve saved other endangered species. And the good news for the right whale, says noted conservation biologist Richard Primack, is that the challenges facing it may not be insurmountable. Unlike, say, polar bears, they’re not facing extinction because of large-scale ecological changes prompted by climate change. The right whale is mostly threatened because of what he calls “local causes” — the fishing and shipping industries. Knowlton, for one, agrees. And she worries we’re not solving those causes fast enough. 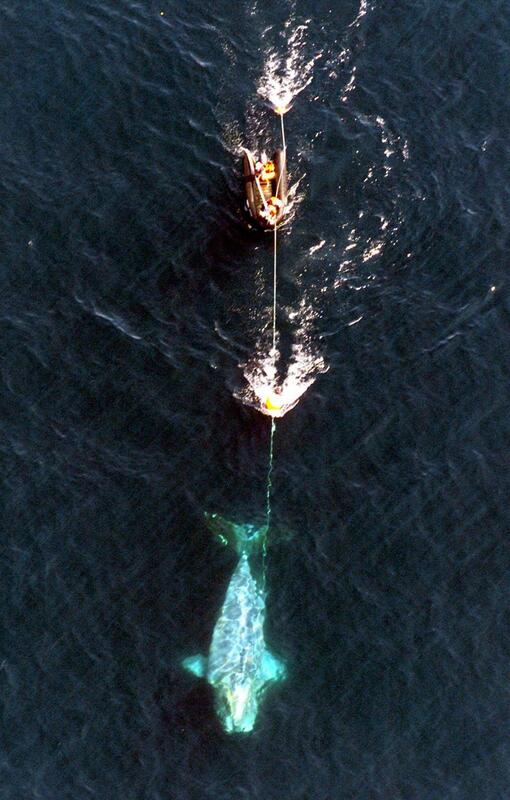 A buoy and fishing lines entangle whale #4057 in the Bay of Fundy. He was freed, but has not been seen since. A week or so after our trip out to Lane’s traps, she forwarded me an e-mail with the subject line “3296 in poor condition with severe entanglement injuries.” Inside, her message read, “The latest sad news on the right whale front.” Below that was a report with photos pulled from a right whale listserv. Scientists had just sighted a juvenile bull whale known as #3296 off the coast of Georgia. Last spring, he was in Cape Cod Bay, healthy and flourishing. Now, part of his right lip is missing. His tail is riddled with scars. His skin shows signs of massive infection and is deathly pale. He is clearly starving. By then, I’d already been reporting on this story for a couple of months. Even still, it was impossible to look at those images with anything other than tearful dismay. I called Knowlton to find out more about what could have caused so much trauma to such a massive animal. She says #3296 was most likely entangled in fishing gear. His prognosis was dire. “Scientists have never seen a whale recover from that level of emaciation,” she warned. In the weeks since, #3296 hasn’t been seen. Kathryn Miles is a writer in Maine. Her latest book is “Quakeland: On the Road toAmerica’s Next Devastating Earthquake.” Send comments to magazine@globe.com. Follow us on Twitter @BostonGlobeMag.